Every HubSpot account has a unique Hub ID, which is used to help identify your account. It is also used when connecting certain outside integrations to your HubSpot account. To find your Hub ID, click your account name in the top right corner. Your Hub ID will appear in the menu under your account name. 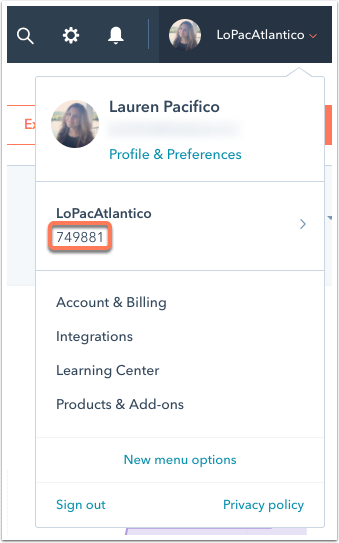 If you are a user with the same email address in multiple HubSpot accounts, you can also switch between your accounts from this menu. Hover over your account name and Hub ID to preview a list of your accounts. To see a list of all of your accounts, click All accounts. Here you'll see all your HubSpot accounts and a glance at the sessions and leads for each. Click the Compare sessions dropdown menu to see the change in sessions week-over-week, month-over-month, or for the previous 30 days. To pin an account to the top of your account dashboard, hover over the account and click Pin. To access an account, click the name or hover over it and click Open.